I rarely make the same thing twice in a month. Even rarer for me to make something four times in a month. And it’s quite possibly unheard of for me to serve the same dish to guests twice in a week. Well, sickness I think I’ve made this salad five or six times in the last month. And since it’s become Tom’s favorite, he’s been asking for it constantly, and I’m finding myself more than happy to oblige. So, what is it about this salad that makes it so irresistible? I think it’s the bright and slightly sweet dressing, the freshness of the mint and cilantro and the fact that you can eat a whole heap of it and still feel really good about yourself. It’s one of those rare meals that is immensely delicious and really healthy. Best of all, it keeps in the fridge for a few days, even after it’s been dressed, making for some tasty leftover lunches. I like top mine with some sliced steak, but it’s equally good with grilled chicken, pork or shrimp – just use whatever you happen to have on hand. It’s the ideal salad for the end of summer heat. Make the noodles according to package instructions, run with cold water to stop them cooking, then drain completely. Whisk all of the dressing ingredients together until evenly combined. Set aside. Place all of the ingredients, except the steak, in the biggest bowl you have and drizzle with the dressing. You may have to use two bowls here. Toss with your hands, tongs or a couple of serving utensils until everything is coated with the dressing. Heap into bowls and top with steak. Serve sriracha on the side. Vietnamese bowls are the shiz. I can pound a giant bowl of bun cha to the face and still feel like a zillion bucks!! 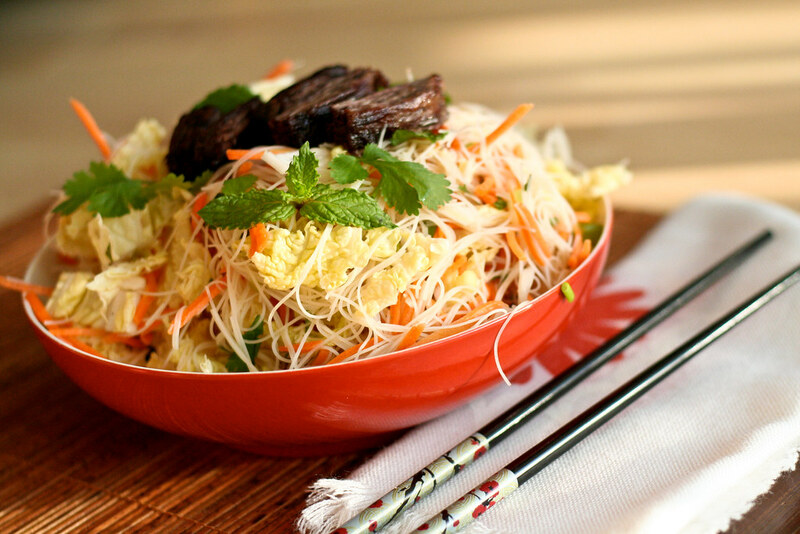 I love the idea of a simple Vietnamese salad… I will certainly be giving this a try soon!! Yum, I must try this soon. Love hearing recipes that you can’t help but make over and over. This looks so good! Delicious flavor combination. Can’t wait to make it! I love Asian inspired salads, but there are so many that are really flat or too conventional. However, yours looks really delicious. I can’t wait to try it! Yes, this is definitely the kind of salad that I could eat over and over again – day after day. Great photo! FYI – I’m making this tonight – thanks for the inspiration! Vietnamese cuisine is all about fresh herbs and veggies combined with tasty meats. Great recipe! One of my favorite recipes is Nigella Lawson’s Vietnamese chicken and mint salad. Very similar to this recipe, except she doesn’t add soy sauce, or noodles, and she uses vegetable oil instead sesame. She doesn’t call for cilantro either, but I always add it because I love it (the mint makes it all so bright.) You’re right, eating this makes one feel very virtuous.